For organizations determined to achieve the depth of transformation required to remain competitive today, Work Systems has developed a framework composed of five critical dimensions that simplify performance acceleration. We call it the 5Dimensional Framework. As organizations excel at change, the competitive challenge becomes more and more about who can get better faster. Improving slowly often means failure. And getting better faster requires a reliable and profitable system that will unleash a substantial percentage of your work force in driving performance gain. 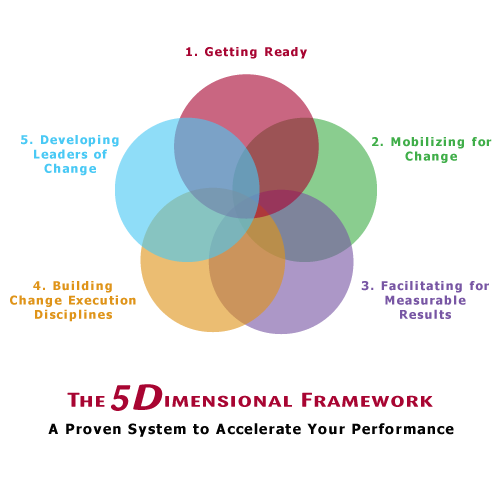 Watch the video below for a brief introduction to our 5D Framework. By themselves, each one is an effective tool for improving performance. However, together they provide a proven and powerful system for achieving new levels of profitable performance acceleration. Our system is a comprehensive framework that integrates and drives multiple performance improving initiatives. This approach is absent in many transformation initiatives. The blending and linking of these five dimensions generates a capacity to drive change far more effectively while also being more easily managed than initiatives where only a few of these dimensions are employed. An all too common approach for improving performance is to tackle one dimension at a time (LEAN, innovation, leadership development, performance management, organizational health etc. ), To accelerate beyond the limits of one dimensional transformation, a framework to integrate and manage multiple parallel themes is needed. The old approach cannot compete with organizations deploying multiple parallel initiatives. Most executives are aware of the need to drive transformation at a highly accelerated pace. Without a faster pace, the competitive advantage needed to compete will be lost. This article introduces a proven system that accomplishes this goal, thus accelerating the achievement of profitable performance advantage. In addition it also greatly simplifies the executive challenge of achieving outstanding performance. almost zero. In the same time Apple acquired close to 70% of the profits with only 9 percent of the market. With change happening this fast, no one is immune from having to adapt rapidly to meet changing business challenges. As executives contemplate what to do to ensure long-term survival, we believe it is absolutely necessary to build a reliable system for continuously increasing profitable performance advantage. As the Apple example illustrated, trying to accelerate after you are behind the 8 ball is too late. Our approach provides a much simpler, more comprehensive way of addressing the challenge. After over 30 years of helping organizations around the world successfully approach business transformation and dramatically re-invent themselves, we have become very clear about its importance and what does and doesn’t work. Executives are beginning to realizing that achieving a single transformation is inadequate to maintain the pace of change modern business competition demands. After achieving a significant change that improves business practices, the success generally creates a new steady state highly resistant to change. proof of their innovative culture. Their 15 years ago innovation had created both competitive advantage and lethargy for the future. The concept of sustainable transformation means every change builds on and reinforces the previous one. To achieve this a constant purposeful focus on improvement needs to be achieved. The 5 Dimensions address this challenge. All businesses need to be focused on successfully executing the current day-to-day operations and ensuring adequate profit and growth. The day-to-day pressures often create the tyranny of the urgent which prevents good planning and management of the Getting Better priorities. More than ever an approach is needed to prevent the tyranny of the urgent from pushing tomorrow’s development priorities off the table. competition — get lost. With short-term pressure increasing, sustaining a long-term perspective becomes more challenging. A good system for driving sustainable performance advantage ensures this priority never gets lost. To do this, executives need solutions that radically improve the pace without increasing the complexity of doing so. The good news is that it isn’t that hard to do. Most organizations have created structures that oppose change and stabilize the steady state. Work Systems has developed a systematic approach that addresses this challenge. It makes both aspects of the business easier. Improving the “getting better” practices only works when it blends a long-term perspective with the day-to-day pressures. When you deploy using the 5 Dimensions, instead of a few committees looking at the long term, a virtual army of workers (often up to 30 – 40% of the work force) becomes engaged moving the company forward to a higher level of performance. Tomorrow’s focus is more easily sustained by providing a permanent structure to support and oversee change efforts. The result becomes a greatly simplified process for CEOs to manage. This series of articles on the 5 Dimensions shows how such a reduction in complexity is possible. By reducing complexity the system to support sustainable performance advantage enables your organization to not only continuously change and change faster, but as we said earlier it also enables the deployment of multiple parallel transformational themes while reducing stress. To achieve this, Dimension 2 “Organizing for Change” is of particular importance. It provides a separate organizational structure, parallel to the hierarchy, that enables CEOs to delegate broad organization-wide initiatives. Each theme deploys multiple solution teams that are responsible for various components of their thematic challenge. As a result, individual change initiatives are accelerated while multiple parallel initiatives can be effectively managed. This is achieved through a customized deployment of Work Systems’ 5 Dimensions as a framework for guiding any change initiative. The dual operating structure holds it together. With transformational change, what you don’t know can really hurt you. We help you identify the challenges that need to be faced in order to drive change at an accelerated pace. 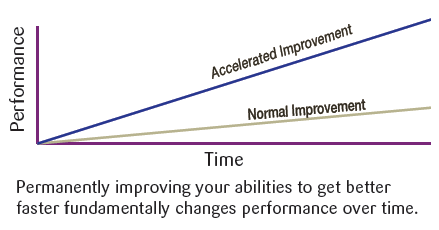 “Getting Ready” is the first of the five dimensions … and not doing it well can negatively affect the Performance Acceleration you are able to achieve. Getting Ready is all about discovering the hidden, root causes, and roadblocks to transformation. It is about measuring the Organizational Health and having candid conversations about the undiscussables. Rushing to change without properly understanding the hidden challenges slows down change and often is the cause of failure. Work Systems provides a comprehensive assessment of current conditions that guide the planning process. After experiencing such an assessment clients have made such statements as “If we hadn’t gone through the getting ready process, we would have done all the wrong things”. Hierarchies are naturally change resistant structures. 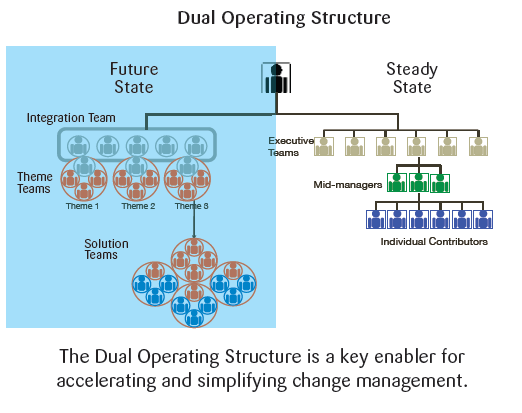 Change effectiveness can increase 2-3 times just by using our dual operating structure similar to what you see in the above chart. We work with you to identify the challenges unique to your organization and design the team structure that will best help you achieve an effective deployment. Then we work with you to mobilize the teams to drive transformation through the new “Future State” structure. Most of the work is done by your people. Work systems just guides, facilitates and coaches the process. Change doesn’t matter if it doesn’t affect the bottom line. We work with you to identify the right challenges that will generate big payoff, we create target measures to guide the transformational initiatives. The facilitation process enables teams to instantly apply a new set of disciplines to the transformation projects. By facilitating a team through the analysis, design and implementation process, teams become significantly more effective and real results are achieved that could not be achieved otherwise. Facilitation provides the trust building and guidance that enables the teams to take a transformational approach to the challenge. The end result is payoffs that fund the development initiative and generate confidence that together we will succeed. Sustainable transformation is built on effective culture with strong change execution disciplines. As we facilitate teams to achieve effective change, team members develop and master the ability to lead and guide change. At the start guidance is critical for success to be achieved. As skills mature less guidance is needed and the organization develops a growing ability to lead and implement complex change in a manner that previously was impossible. To be sustainable, your people need to be effective as leaders of change. Our approach is designed to bring your leaders to the next level. Change leadership is needed at several levels. A variety of support structures are available to ensure the leadership within the organization matures to the level required to achieve success. Instead of training or coaching that is isolated from challenges, coaching is provided to help leaders become successful at addressing the transformational challenges being faced by the teams and executive leadership. We’ve identified that the pace of change today is driving the need for a new model for managing change. It must simplify the overwhelming complexity of building sustainable performance advantage. The Five Dimensions provide a framework to enable a broader and deeper level of leadership for achieving accelerated change. The depth of support applied to each of these dimensions is comprehensive and deep. The 5Dimensional Framework can be adapted to virtually any organization based on its size, complexity, and maturity of its current leadership skills. The following highlights the synergies created between each of the five dimensions. Getting Ready creates fast buy-in and deep insight. design that generates the buy-in needed to ensure success. Facilitating for Measurable Results enables multiple teams to effectively lead a variety of concurrent initiatives. The facilitators provide a level of integration not otherwise possible enabling teams to instantly perform with superior disciplines and results. Building Change Execution Disciplines happens across a broad cross section of the work force. This results in a substantial improvement in the implementation capacity of your organization. Developing Leaders of Change ensures your bench strength of leaders grows as team members take on responsibility to actively lead transformation projects. Along with a structure for leading change, this translates into an enduring culture shift where leadership becomes a strategic advantage. The end result is an organization that achieves a substantial improvement in it’s ability to increase performance advantage and to lead transformational initiatives on an ongoing basis. For more details on how this is done we have published 5 articles: one for each of the 5 dimensions. For a copy of the articles or if you’d like to have a conversation about how the 5Dimensional Framework can be applied to your organization, Contact Us Today.